Thank you June Barnes of the Australian Storytelling Guild (Vic). “Well, the story reaches out and touches each listener in a different way. Like an omniscient, it knows each individual’s needs at any given time. It will either speak to a need in the listener or brush by with a caress, or a tap on the shoulder. The story can act as a catalyst in commencing the process of solving an emotional problem, enlightenment, preserving a culture, helping another, bonding families or communities. The story can generate the healing power of laughter and assist in the education process. Sometimes the story is a trickster, it pretends to entertain just to get inside the psyche, and then it jumps up at the listener with a timely message. It seems there is no end to the power of the story to seek out that searching part of an individual’s psyche and touch it. But do I, as the storyteller, know what the story is giving to each listener? No, I am not extended that privilege. Only the story and the listener know this. But wait, sometimes the listener doesn’t even know. The story sneaks in and finds a place to rest and then awakens at the appropriate time in that person’s life. So the story IS the dominant partner. What about me then, the storyteller, what contribution do I make in this marriage? Well I provide a vehicle for the story to come to life. But the same can be said for singing and other mediums of presenting a story. How am I, as an oral storyteller, different? Am I different? Please say Yes! Well… as an oral storyteller I do act as a personal communicator, I form a personal relationship with the listener. The listener knows me, or a part of me, through the story. Is that my contribution, to assist in preserving the personal relationship in society? Is the listener more (or less) receptive to the story because of the personal nature of the relationship between teller and listener? Is that what makes oral storytelling unique? Perhaps not! A singer, musician or dancer also establishes this personal relationship. But do they allow the story to develop and mature because of the interaction between the teller and the listener. In other words do they give the story the freedom to live. Do those other methods of presenting story allow the story to change, in the way a living organism changes, according to the circumstances and community it finds itself in? In oral tradition, the story grows inside the teller the more the storyteller tells the story to others. Stories come to live in the presence of a listener or listeners, for without them, a story can never become a reality. Responsive listeners allow us, as storytellers, to see what our audience members are hearing. Storytelling is also interactive, therefore, by its nature, stories require the presence of listeners as well as a storyteller. A storyteller is not a teacher, a preacher, a counselor or a reporter. A storyteller is simply the teller of a tale. How the power of story touches or impacts its audience members is up to each individual’s unique interaction with the story and its storyline. Story – the place where life is as it is; Change Happens – a new normal unfolds. Story; a taste of heart a touch of love. A juicy, creatively bubbling throb wells up from within. Storyspirations ignite the brain’s image-filled imaginations. Then it happens. Ideas talk. You talk. Others listen. A Story begins in the heart, travels up through larynx’s vocal accordions. Once released, for those willing to receive, this story finds its new, heartfelt home in the pulsating arteries and rhythmic chambers of yet, another’s heart. Story’s vivid realism and outrageous adventurous as wildly zanny as any of us are. In the wisdom of the ancients, Chinese Medicine sites the lips and hands as the heart’s external, visible components. By extending a hand or a kiss, we let others know; welcome, from my heart to yours. Through some heart reaching research, the Heart Math Institute researchers found proof of the brain’s neurotransmitters hanging out not only in the brain but also on the heart. Upon wombs egg hatching fertilization, it’s the heart which tells the brain when it’s time to develop. Definitely one of those awkward ‘who’s really in charge’ type of moments. Life is experienced first through the heart, then transmitted to the brain for more in-depth analysis and processing. When choosing to develop and tell a story, select one which excites your toenails, tickles you earlobes and ruffles your eyebrows. If you don’t love, don’t tell it. Every story we tell is apart of us, a part of who we are, apart of our heart’s experiences. The more enthusiasm, the more romance, the more love we have for our stories and their awe-inspiring adventures, the easier it is to tell. By living in the heart of the moment of the story’s life living reality, we naturally delight and engage our listeners. So join us in extending a hand, embracing a kiss and/or sharing a story as a gift from our hearts to yours. 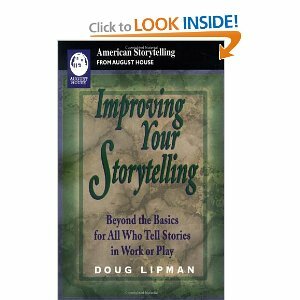 Doug Lipman’s book Improving Your Storytelling is both comprehensive and inspirational. His work addresses virtually every aspect of storytelling from performer preparation, to audience interaction, listener significance, voice care, oral language exercises, story crafting and image enhancement. Being introduced to Doug Lipman’s work at the beginning of my storytelling journey, while written primarily for experienced storytellers, gave me an incredible introduction into both the dynamics and art of storytelling. A veteran in the field of Behavior Health and Forensic Therapy, I found the chapters on imagery and oral language vs written language invaluable in my work with clients and how story, professionally or personally crafted, is developed through repeated tellings and listener interaction. Lipman’s masterful explanation of his MIT (Most Important Point)formula greatly impacted my work in the behavior health field as well as inviting me to put “who I am” into my stories. His inspirational chapter on imagery further ignited my imagination in “trying on” various characters and what it might “feel like”‘ to become these alter egos. Reading his vivid, sensory filled words in the introduction to Snow White I sat back wondering, imagining . . . What if I were the evil Queen, peering through this ebony black defined window pain; staring intently into the mesmerizing back drop of winter’s whiting perfection, my heart welling with the immense satisfaction of my husband’s timely demise . . . ! Then moving from here into the inner essence of each character in the story. Wow! What an incredible experience and insight into the breathing life dynamics of story interlaced with the interactive nature of storytelling. A must read for anyone desiring to expand their awareness and skills in the areas of oral language, imagery, and story as well as the dynamics and art of professional storytelling. Thank you Doug Lipman for this comprehensive, dynamic and inspiring guide into the field of storytelling! For centuries stories and storytelling have played critical roles in preserving, transmitting and changing cultural standards and values on to its people. Storytellers, once high-ranking on the “Most Wanted” to be captured list for invading armies. Too, highly paid entertainers in the local lavatories – I guess if you are just sitting there, you might as well be entertained! Storytellers, the keeper of the stories, the newscasters, the culture bears, the genealogists and the historians of ages past. While researching some of the folktales for my Bug-a-Bration Bug Swapin’ Tale and Tunes and Luminous Lagoon: Buggy Tales and Tunes I became acutely aware of how much of the rain forest in different had been destroyed in my lifetime. In crafting the story-line and the Afro-Caribbean folktales for two kids storytelling CD’s, I developed these stories around the geological context of the type of rain forests in the countries where the stories were told. After collecting basic information on the history of the rain-forests, their endemic and endangered species, including insects, and other fun plants, I began adding them in to the story-line, as a tribute to these amazing creatures and the world they live in, as well as honoring the integrity of these stories. 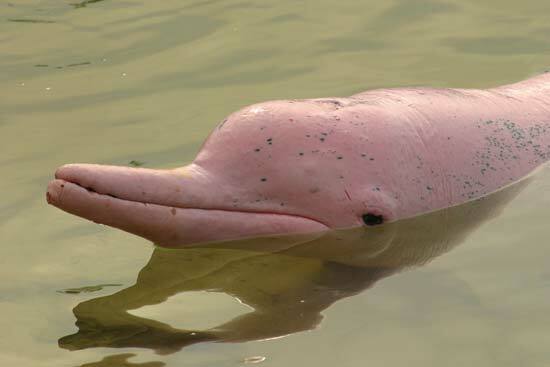 As a result, I got to meet wonderful creatures such as the boto, pictured above, or the pink river dolphin found in the Amazon rain forest as well as black pineapples, lemon tasting termites and the Victoria Rega, a six-foot giant waterlily. In the limestone rainforest of Jamaica ; the lampid firefly, stinking toe trees and cho cho’s, as well as Luminous Lagoon in different section of the island.